Euthanasia is a non-political issue in India. It does not receive adequate political attention necessary to arrive at policy solutions. This paper – the first of its kind – explores the role of the Supreme Court of India in euthanasia’s policy making process. Why the Supreme Court of India? In 2011, it established passive euthanasia as a temporary law in India. This 2011 judgement in the Aruna Shanbaug case is the first and the only instance that brought euthanasia some public attention. This judgement therefore is the empirical focus of this paper. The paper employs two techniques of discourse analysis to study the Court’s system of argumentation. The two methods, Text Analysis using Gasper’s Analysis Table and Frame Analysis – are complemented by other discourse techniques of metaphor analysis and lexical analysis. The results of this paper are three-fold: 1) The Court dismissed the petitioner’s request for euthanasia on weak grounds, thereby setting no precedent for the ‘historic’ procedure it put in place. In other words, it left the decision open for the Parliament to decide. Hence, the judgment cannot be considered judicial overreach. 2) It defines euthanasia in a way that is reflective of broader societal themes. It combines this with its accepted authoritative and protective stance to find an intermediate position to balance the possible opposition to its role in the process and what it (perhaps) perceives to be an optimal solution. 3) It softens up the policy community (including the public) to the idea of passive euthanasia in India leading it towards a Parliamentarian legislation. It achieves this by shaping prevalent principles, provisions and worldviews through a remarkable use of its legal instruments. 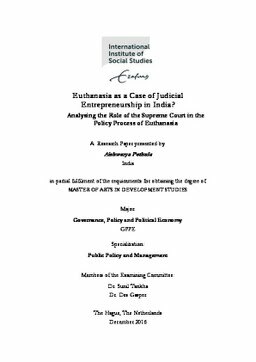 This paper refers to this unconventional role of the SC as ‘judicial entrepreneur-ship’ which is also the first scholarly contribution towards research on euthanasia as a policy issue in India.